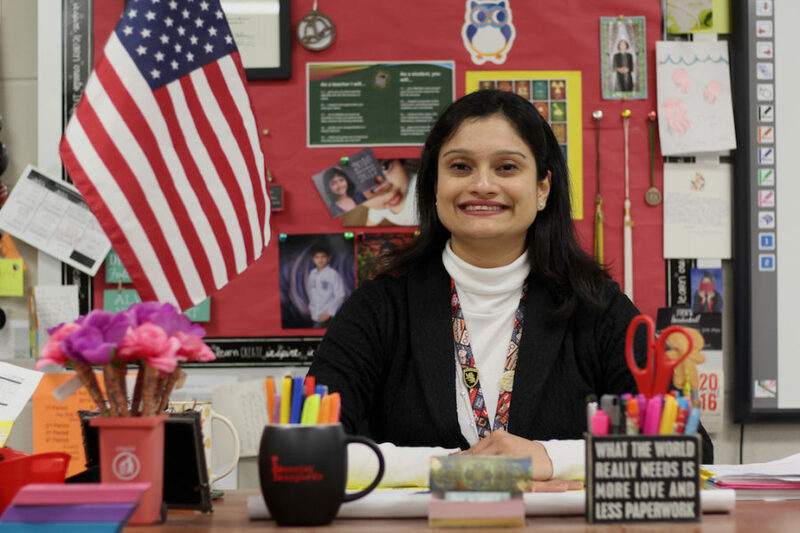 Despite current political turmoil and social persecution, AP Biology teacher Sadaf Syed, a practicing Muslim, continues to view the world as "full of beauty." It was the fall of 2003, and the North East Mall in Fort Worth was packed with people, just as it was every Saturday. Sadaf Syed, with a gray hijab wrapped around her head, pushed her newborn son through the crowd in his stroller. Her son was actually the reason for her outing — after being cooped up in the house with the child, she wanted out. Besides, she was a big window shopper and could spend hours at the mall without becoming bored. The mall was pulsing with footsteps and chatter, but above it all something began to buzz in Syed’s ear: laughter, coming from a man and a woman right behind her. Then a single word cut through the air and her heart. The man hissed the word and yanked on her hijab. He yanked on the garment that brought Syed a feeling of peace and a sense of modesty, the purpose of the hijab and many other regional coverings. He yanked on the garment that gave her the feeling that she was judged not by her physical appearance, but by who she was as a person. Shocked, Syed reached to hold onto her head covering and continued walking. She didn’t say a word, but after a moment, she decided to turn and look at her harassers. Maybe they didn’t say that, she thought, desperately hoping the ordeal didn’t happen even though the word and the tug had been clear as day. When Syed met the couple’s eyes, they laughed in her face. “It looks like a towel,” the man sneered. In that moment, Syed said she knew “things were changing.” In fact, her parents, who never forced her to wear a hijab in the first place, asked her to consider taking off the covering out of fear for her safety. 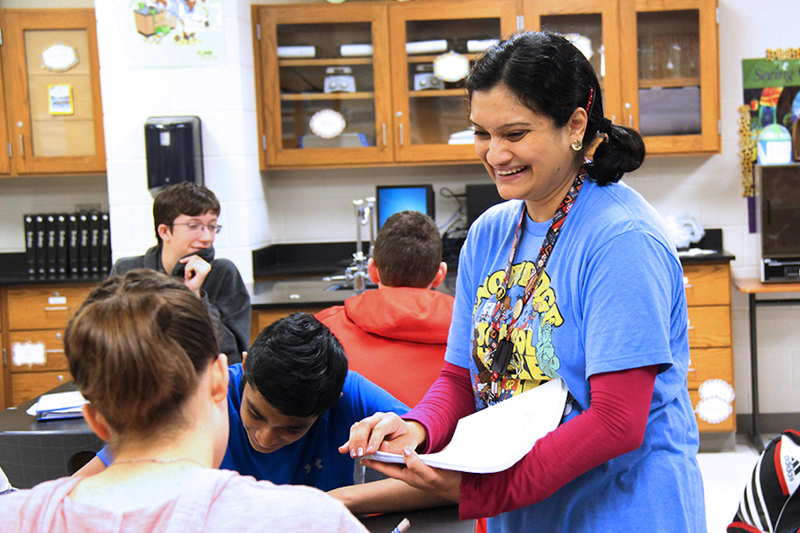 Syed laughs as she passes out a quiz to her seventh period students. Syed said she felt “more accepted” after moving to Allen from Fort Worth. Syed finally decided to take off her hijab for two reasons. The first was that the covering kept her from obtaining a job, which she wanted after her husband’s occupation as an engineer became at risk due to outsourcing. After being a stay-at-home mom for 10 years, Syed got her pharmacy technician certification and applied for a variety of jobs. But the hijab impeded her search. She decided to begin applying to places like Target and Wal-Mart, as “those jobs are easier to get, supposedly.” Still, she had no luck. In the fall, some of Syed’s old fears flared up again during the presidential election when the topic of banning Muslims entered the political debates. Syed’s daughter, who heard people talking badly about Muslims in school, even asked if they would have to leave the country. A similar event took place in Plano when non-Muslims held up signs to say, “We are with you,” as Muslims went to pray. Syed said she thinks these acts of love will lead to increased communication and understanding between diverse people. Syed also said that communicating with different people leads to a new view on the world, one filled with magnificence and radiance. Though Syed has faced negativity, fear, and loneliness, she has retained her radiant smile and positive outlook, which is evident in the ever-cheerful voice that greets her students in room E211. What a beautiful article Hannah! Your writing is amazing (as always) and the content of this story warms my heart & makes me proud to be a part of this community. This article is beautifully written and brought me to tears. I’m happy that although Lovejoy is not perfect the majority of it’s population is kindhearted and accepting of people’s differences. What a great article-well written and expresses great content. Sadaf Syed is a good friend and I have known her for more than 5 years. She is an amazing teacher and she is a wonderful person! I know that sometimes it seems that negativity and hate prevail but I also think there is more acceptance and love if we all choose to see it and embrace it! Absolutely love this! Not only is it a wonderful story about an amazing person, it’s eye-opening to non-Muslims as to what Muslims are living through right around us. Beautiful article about a beautiful person. Hannah, what an amazing article! I’m sooooo proud of you and your amazing writing! I especially love this story because this is something I’m very passionate about. I’m glad you were able to write about it.